ADD UPDATE, 7 January 2018: Important: to give your consent to be a co-signatory to one of our supporter’s letter to the Daily Telegraph, please ‘like’ THE COMMENT (on our Facebook page – see screenshot above), NOT THE POST ITSELF. 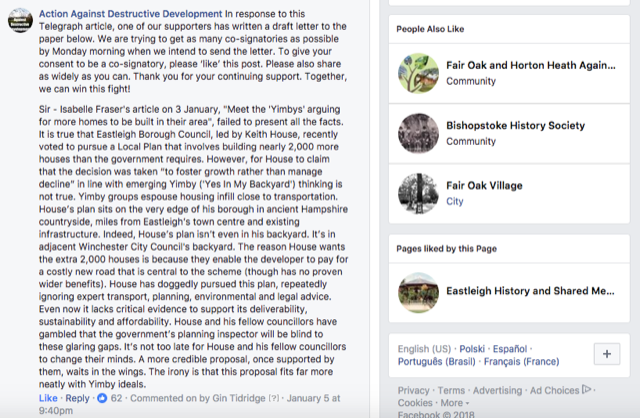 As many of you know, one of our supporters has written a letter to the Telegraph following Wednesday’s article about Keith House, Eastleigh’s Local Plan and Yimbyism. We posted this letter as a comment on our Facebook page on Friday evening and are collating as many co-signatories as possible before sending it to the paper tomorrow morning (Monday). Together with email agreements, we are gathering an excellent number. Of course, the Telegraph may not want to publish our letter, but we can try. Thank you to everybody for your continuing support. Together, we can win this fight!